We've taken the office-critical features of our departmental MFPs and packed them into this ultra-productive LEGAL-size printer. 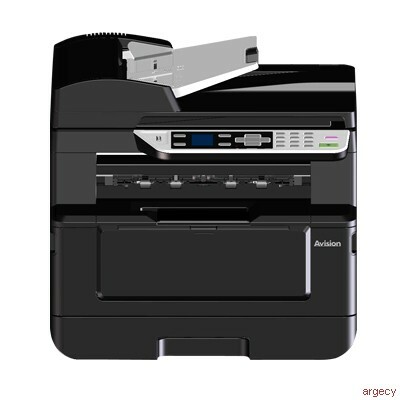 It seamlessly integrates print, scan, e-mail, fax, and copy functionalities. Plus, the product can be connected to the computer through a wired or wireless network. All these features are operated through a clear and large LCD screen to simplify work for busy offices with high-volume of document distribution. The product is designed with various advanced copy features which includes ID card copy, auto rotate to match output paper, paper saver to copy multi-page document onto a single sheet and etc. When the product is connected to a computer through a USB or a network port, it is able to perform local printing or network printing. What is best, a print job can be held in queue until a PIN is entered, releasing it to print. With the built-in fax modem (33.6 Kbps Super G3) and an additional telephone line, the product is able to transmit your scanned document to a remote fax machine just like regular fax machine. In addition, a password can be required before incoming faxes can be printed or removed, and a junk fax barrier protects your privacy. Without complex setting, the product allows you to save your scanned image to a removable disk (Flash) through the USB port. The scan-to-email feature lets you scan paper-based documents in full color and e-mail them as attachment in PDF, JPEG, or TIFF file format directly from the product. The scan-to-filing feature allows you to scan the documents and save them to a folder of a personal computer or any server in the network including FTP, or CIFS. Easy to read and navigate, 1.7-inch, bright color LCD screen guides you through even the most complex operations. Simply make a few presses on the control panel, your document can be digitized and distribute within seconds. Through the optional 35-sheet automatic document feeder, the product allows a stack of 35-page document(s) to be continuously scanned and transmitted at one time in reliable quality to increase your efficiency. The product provides a convenient way to view the supplies status of printer cartridge, scan count, and copy count to help you maintain the product well. By simply typing the machine's IP address in the URL field of your browser, the product's embedded web page will be prompted.